"I saved 70% of the estimated development time using Iron Speed Designer." 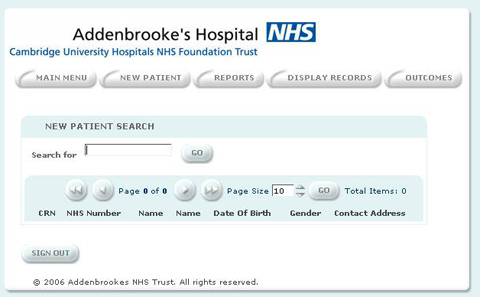 The GP Liaison Nurse Database was developed for the Emergency Department at Addenbrookes Hospital. The application is used internally by GP Liaison Sisters to capture information about patients who are referred to the emergency department by their general practitioners. A user can search over 1.9 million records almost instantaneously. An application transaction is initiated by a phone call from the patient's general practitioner. The doctor must call the hospital directly in order to file a patient admission request. Since the application connects directly to the hospital's main Patient Administration System (PAS), a user can log in and perform a patient search across 1.9 million records almost instantaneously. Once a record is located, the user works with the patient's doctor over the phone in order to quickly complete the remaining clinical information. The electronic patient referral form helps users collect detailed information quickly. The GP Liaison Nurse Database also stores and manages patient demographics and clinical symptoms. It provides reporting functionality to monitor the types of referrals received by the hospital, as well as the outcome of each patient. 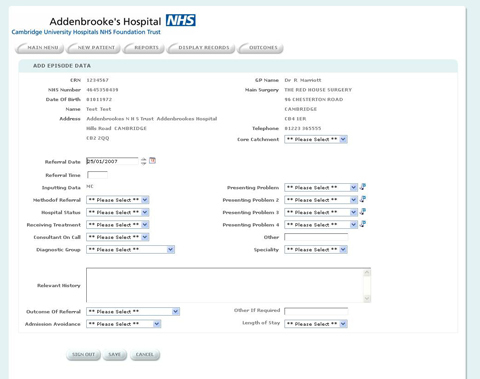 Addenbrookes Hospital uses this information for organizational planning and clinical assessment. The application is comprised of 15 tables across two Microsoft SQL Server databases. The largest of these is the main hospital data repository, the Patient Administration System, which holds approximately 1.9 million records. There are 51 Web pages within the application. An average of six users access the database, so approximately 14,000 transactions go through the application each month. The application was completed in just one month, with the Iron Speed Designer portion of the project taking three weeks. This application used only standard out-of-the-box code customizations from the Iron Speed Designer Code Customization Wizard. A user can login to enter a patient's clinical symptoms. We used the standard "White" design theme provided with Iron Speed Designer for the basic page styles. Our customization code centered all the pages in the application. I completed the project in six weeks using Iron Speed Designer. This would not have been possible on my own. In the end, I saved 70% of the estimated development time using the tool. The next stage of development is to implement role-based security in the system to allow designated administrators to add and delete users. Stage three development will add records output to PDF, and exporting them to our existing Electronic Medical Records (eMR) system. 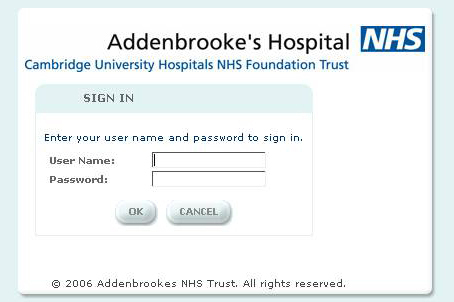 Marc is the Application Support lead at Addenbrookes NHS Foundation Trust. He has worked at Addenbrookes for more than three years, primarily supporting and developing Trust applications written in Microsoft Access and Microsoft SQL Server. While Marc has experience in Web development, particularly static and interactive training tools, he had no .Net experience prior to completing the GP Liaison Nurse Database application with Iron Speed Designer.